AWStats is a powerful tool that creates graphical reports from your website's access logs. It's a great tool for taking a quick look at things such as visits to your site per day, and the number of pages viewed on your website. In this guide I'll go through each section of a AWStats report and explain important things to keep an eye out for when trying to understand your logs. The unique amount of visitors you've had to your website. The number of visits to your website made by all unique visitors. 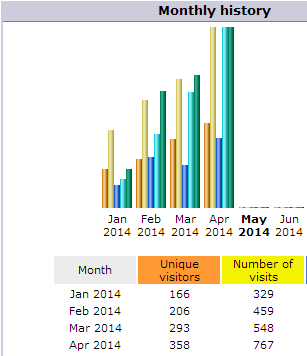 The number of full pages that have been viewed. The total amount of bandwidth consumed serving all of the website requests. 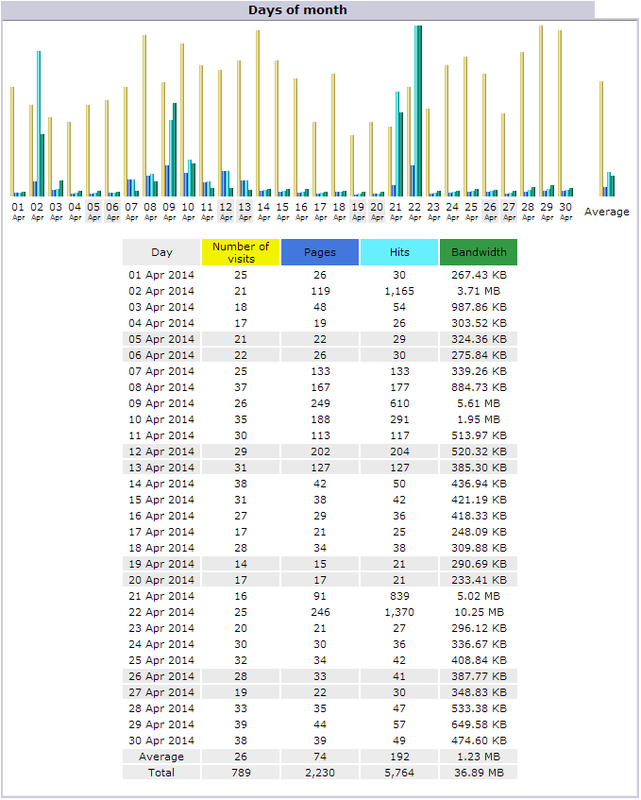 The Awstats summary view gives you a nice overview of the current report period, in this case Apr 2014. 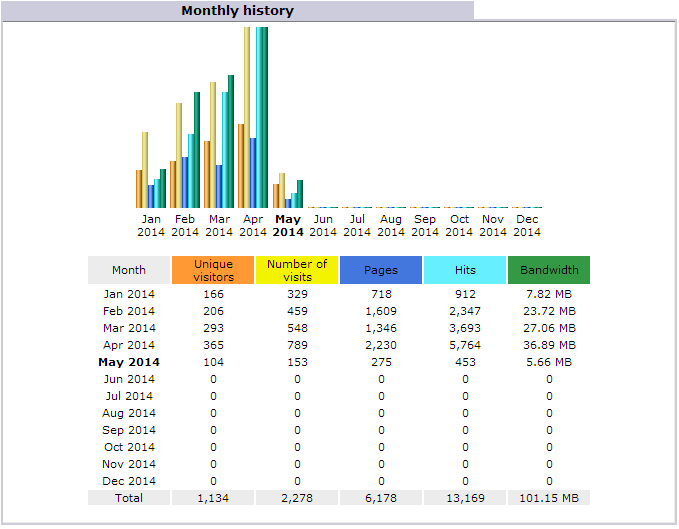 The Awstats monthly history report gives you a look at how your traffic is trending on a monthly basis. The Awstats days of month report lets you easily see what days during a month are your site's busiest. 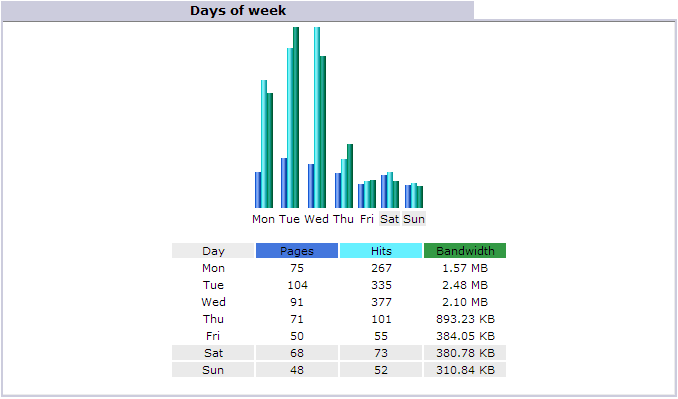 The Awstats days of week report shows which days of the week bring the most traffic to your site. The Awstats hours report gives you a nice view of which hours during the day your site gets the most hits. 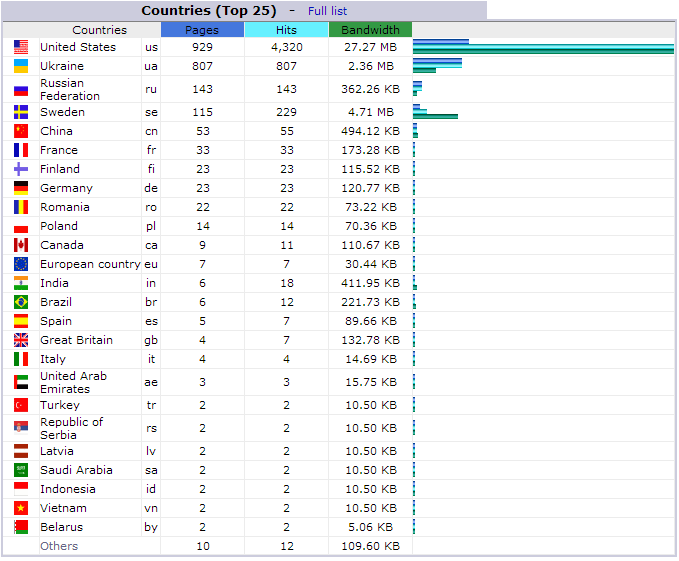 The Awstats countries report lets you see what region of the world your visitors are coming from. 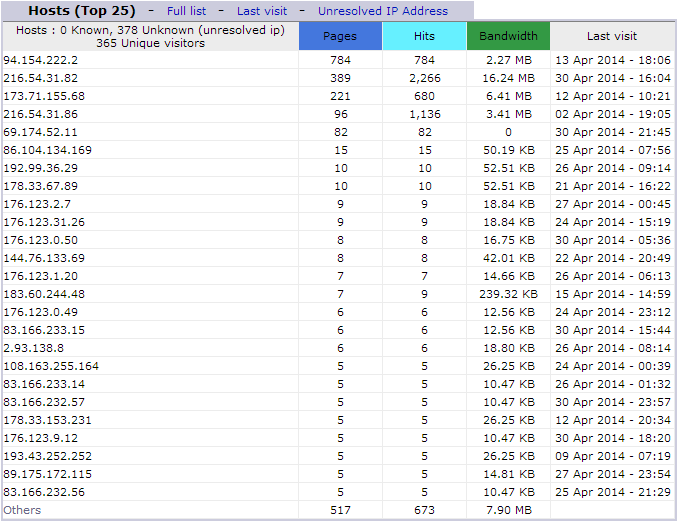 The Awstats hosts report shows the top IP addresses that have been visiting your website. If you notice any that have a far higher number of requests than others, you might want to think about blocking unwanted users from your site using .htaccess. The Awstats robots / spiders report shows non-human visits from search engines and various other automated sources. You might be interested in temporarily blocking bad bots or stopping search engines from crawling your website if you notice higher than normal CPU usage in your CPU graphs. The Awstats file type report allows you to easily see what type of files are requested the most often. The Awstats pages URL report lets you easily see what pages are being requested the most. The Awstats operating systems report lets you see what operating systems your visitors are using. The Awstats browsers report allows you to see what web browsers your site is being viewed with. 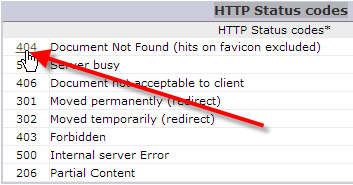 The Awstats HTTP status codes report let you see out of the ordinary HTTP responses that your website is giving. 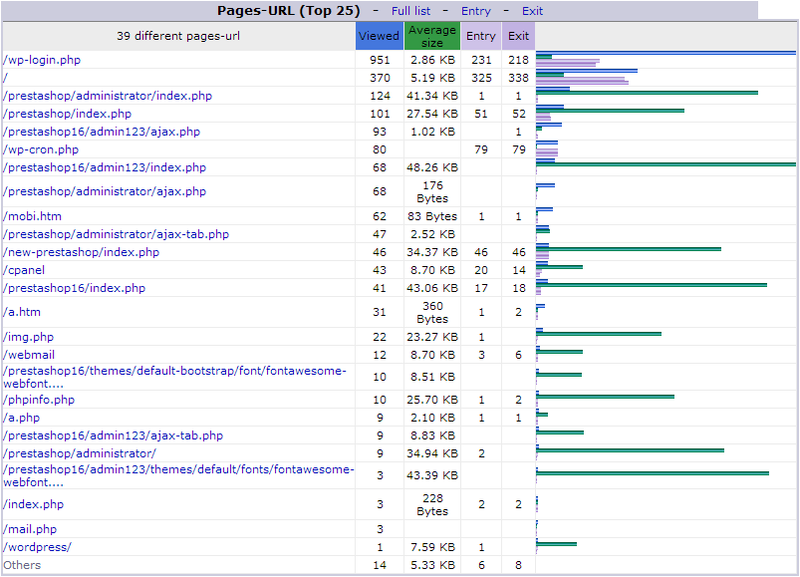 You can see that there were over 700 404 errors from bots trying to hit this website's wp-login.php script. Can Image Hotlinking create Exceeding Bandwidth problems? The latest AWSTATS version also constains statistics for downloads. It starts with the top ten, but the "full list" is also available. Following the pdf file name, there are 4 columns. The first and second column concern "hits". The 3rd column is "bandwidth" and the 4th "average size". I don't understand the operational difference between the two columns of "hits" and I am not sure how AWSTATS arrives at the "average size". I tried dividing the BW by the first "hits" column. Sometimes this agrees with the "averge size" column, other times not. I also divided the BW by the sum of the two "hits" columns. Again, my result does not equal the "average size" column. I also do not understand, how AWSTATS arrives at the top 10, when the first "hits" column does not agree with the "Bandwidth" and the "Average size" columns, in terms of rank of values? Given the disagreement, which index is the most reliable in terms of popularity? Sorry for the problems with understanding the AWStats. Please review the definitions for the stats that are generated by reading through this article or through their direct documentation. Having a better understanding of how the stats are generated should help answer your questions.